Ceiling fans aren’t simply about functionality anymore. With more designers stepping up to the challenge of making that which is functional also stylish, brands like Monte Carlo are creating unique show stopping pieces that can be used in any room. Whether you need something compact for a small space, or a fan with a wide wingspan to cool down a large room, Monte Carlo ceiling fans have it all. Whether or not you have air conditioning installed in your home, a ceiling fan can be a useful tool to have on a hot day or a sleepless night. Despite the undeniable utility of a fan, are you hesitant to install one in your home? There is no need to worry about these ceiling fans cramping your style because Monte Carlo has reinvented the clunky designs of the past. Their sleek, modern collection of Monte Carlo ceiling fans outshine many other lines on the market, proving that functionality and design can come together to create something brand new. The Monte Carlo fan company has dedicated itself to designing fans that are both beautiful to look at and engineered to work efficiently. Every element of each fan is designed to contribute to its exceptional performance. These fans have powerful energy efficient motors that allow for ideal air circulation—without any noise pollution. Due to their whisper quiet blades, these fans manage to fulfil their purpose without producing any of the noise that you might expect from such a powerful machine. Crescent Harbor has an immense selection of Monte Carlo ceiling fans to choose from, ranging from mini and micro indoor fans that start at only 20 inches in diameter to large outdoor fans that are between 46 and 57 inches in diameter. Depending on your needs, many ceiling fans come equipped with a light, while others do not. You also have the ability to choose between various finishes and blade options; this allows you to customize your fan just enough to match your own personal style. 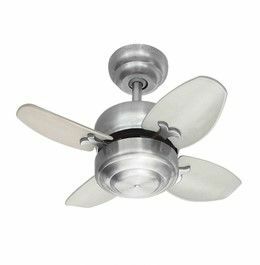 Small fans, such as the Monte Carlo 20” Mini in brushed steel, allow homeowners the opportunity to install a fan in even a very tight space. Do you have a bathroom, closet, or attic that could use the help of a fan to achieve some good airflow throughout the house? The mini fans offered by Monte Carlo are highly efficient and very practical in small spaces, offering you the chance to install ceiling fans in any room that you think might benefit from better air circulation. At Crescent Harbor, we are sure that you will find what you are looking for at just the right price. Monte Carlo ceiling fans are unlike the boring and noisy fans of the past. The sleek, modern designs that are used match the power behind these machines successfully combine form with function. Whatever your needs may be, contact Crescent Harbor today via email customerservice@crescentharbor.com, or by phone, at 1-888-355-9525. We are always happy to hear from our customers and assist, should you have any questions or concerns regarding any of the products that we carry.